Harriet Wilson is no stranger to farming. Raised on a cattle and sheep farm, one of her fondest childhood memories is going along with her father to compete in cattle shows and looking after calves and lambs with her younger sister – naming them and caring for them as if they were family pets. 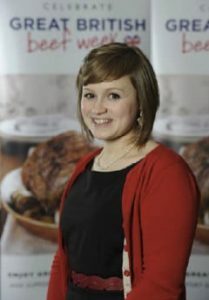 Ladies in Beef is important for Harriet as she believes that beef is a product that is seriously undervalued in the UK. ‘The general UK consumer doesn’t think about the whole process of beef production -all of the work that goes on behind it,’ says Harriet. Harriet aspires to work for a supermarket as the buyer for meat produce or perhaps as a product developer in the meat sector when she completes her university degree. ‘I would like to do that for a few years and then go back home and start up a food enterprise business. What is really important to me is that my whole family continues to work together. We have just bought some Wagyu beef cattle and I would love to cross breed them with British Blues to create an outstanding quality beef.’ With a vision like that, how could you not want to fly the flag for British beef?